Abstract: Automated border control represents one area in the digital transformation of border control. It is gradually becoming a common place particularly at air borders, where the concept of self-service has had the strongest business case also in other steps of the passenger’s journey, such as check-in or baggage drop. Besides providing a means to enhance efficiency and security in passenger clearing processes, the new technology significantly reshapes current ways of conducting border checks from employee perspective. Successful implementation of automated border check technologies thus demands border organizations to equip their workforce with new skills and remodel existing ones. This paper presents a preliminary analysis on current technology training of border guards and assesses its effects on how the new technology is received among employees at the frontline. The results are based on field studies conducted in five EU member states. The study loosely applies a Technology Training Model that extends traditional Technology Acceptance Model by incorporating training as an additional variable to explain employee intention to use new technology. Abstract: In the last years the importance of biometric authentication in border control procedures increased in a way that biometrics have become the core of most border management systems. Current commercial products for mobile border control have not satisfactorily solved both the demand for increasing security checks and the user requirements driven by security personnel such as border guards yet. Due to their flexibility, portable devices are commonly desired during the control process. This paper presents on-going work of an advanced mobile device for border control focusing on usability and integrating new technologies to envision next-generation of mobile devices. The device is based on the MobilePass device but significantly improved. A key technology of the new device is a contactless 4-fingerprint authentication instead of only one in existing solutions. Results based on real data shows the advantages of 4-fingerprint versus 1-fingerprint authentication. Abstract: New security threats and increasing traveler flows as well as needs to enhance facilitation and security in EU external cross-border traffic have accelerated the use of novel technologies in border control. Especially at airports, automated border control, more commonly known as e-gates, have been taken widely into use. With e-gates, travelers perform border check as self-service, and the role of the border guards is to monitor or possibly also assist travelers passing the border. The introduction of automated systems significantly reshapes current ways of conducting border control from the border guard’s perspective, and automation thus requires new skills from them. Understanding the effects of automation on the work tasks and work performance of border guards requires thorough examination. This paper introduces key Human Factors issues affecting border guard and border control system performance. The results are based on literature review and field studies conducted in different border control points within six European countries. The paper presents a Human Factors framework for understanding the complex nature of the border control and different factors influencing to both border control process and border guard performance within it. Description: General presentation of the BODEGA project given by UIC. Description: Presentation of the smart borders pilots in Athens,the FastPass Sea Borders Scenario and BODEGA’s project. Description: Master’s thesis publication. The aim of this research is to investigate how new border technologies are affecting and can affect fundamental rights, particularly the right of non-discrimination. Abstract: The paper discusses the possibilities and challenges in applying e-learning tools in border check training, comparing the training of legal issues and border check practices. The main research question of the paper is how e-learning is utilised in and comport with border guard training. Authors: Sari Lindblom-Häkkinen, Saila Heinikoski, Maisa Anttila, the Finnish Border and Coast Guard Academy, Finland. Human Factors Approach to Study Border Control Automation Impacts and Needs: Methodology and Preliminary Results of Field Studies. Event: Paper delivered during the AHFE conference. Abstract: The purpose of this study is to analyze the current border guards’ activities from a human factor point of view and to provide recommendations and requirements regarding the introduction of the future regulation and the use of automatic systems. The paper introduces the methodology used to investigate human factors at four types of borders based on a systemic human factors approach, organizational factors, technical tools and environmental aspects. From technology assessment to responsible research and innovation (RRI). Abstract: How can technology assessment methodologies be developed to move ethical questions to the forefront of enquiry? This methodological question was one of the key factors in an exercise in Responsible Research and Innovation carried out as part of SNIFFPHONE, a project on medical diagnostics. This paper discusses the methods used to apply Responsible Research and Innovation (RRI) in SNIFFPHONE, one of the European Commission’s H2020 projects. In addition we described shortly implementation plan and first activities of RRI in another H2020 project, called BODEGA. The aim of the project is to build an expertise at the European level about human factors in future smart borders (e.g. ABC gates, video based risk analysis) in a way to enhance its efficiency without negative side effects. Event: Paper delivered during the 2016 WCRR conference. Abstract: The European Union is developing a new organisational concept of its borders, the “Smart Border Initiative”, in order to facilitate door-to-door travel and improve economic exchanges. Within this framework, and to cope with the increasing demands of growing cross-border flows, the Border Guard authorities are searching for new innovative solutions for border checks technologies, processes and will invest in infrastructure. The challenge is to organise a new efficient border control facing up to the risks and threats linked to illegal immigration without penalising the normal flows of passengers and goods needed by the European economy. From the traveller’s point of view, the border checks should be a simple, fast and hassle free process. In this context of a future vision of the borders, the European project named “BODEGA” (BOrDErGuArd – Proactive Enhancement of Human Performance in Border Control; www.bodega-project.eu) will help travellers to access and pass the border control system smoothly by introducing totally new and innovative tools for border guard training and traveller guidance. BODEGA’s approach will proactively target the needs and requirements of different groups of stakeholders, including citizens, especially regular travellers. BODEGA will develop recommendations to improve the overall performance in border checks and therefore contribute to the effectiveness and security of European borders. The originality of this approach is to develop a multi-disciplinary international expertise and develop a novel methodology including ethical, societal and legal considerations into a set of human, organisational and technical factors. Description: This article is based on a session of the Finnish Border Guard at an international UArctic Congress and published in the Finnish journal "Rajamme Vartijat". Abstract: Teknologia on yhä tärkeämpää rajatarkastajan työssä. Rajavartija käyttää erilaisia tietojärjestelmiä ja teknisiä apuvälineitä päivittäin. Esimerkiksi asiakirja- ja sormenjälkilukijoita hyödynnetään maahantuloedellytysten tutkinnassa ja maastalähtötarkastuksissa. Description: This newsletter presented the BODEGA project, the traveller’s survey available in 8 langages, the field studies carried out in 6 EU countries, the first project results addressed at the joint BODEGA-ABC4EU showcase event in Finland and the BODEGA participation to a joint exploitation event in Paris. Event: Security Document World (SDW) Conference and Exhibition 2018. Queen Elizabeth II (QEII) Centre in London, UK. Description: The event provided the BODEGA consortium with an opportunity to disseminate project results to stakeholders from government and industry as well as from the side of travellers. The event was also leveraged for gathering feedback on the solutions devised during the project and establish useful contacts in view of collaboration initiatives that may be undertaken after the end of BODEGA. Description: Article presenting BODEGA’s project in the UIC focus edition. Description: This newsletter addressed the Border management experts debate in the first workshop, the presentation of BODEGA at the EU-LISA conference in Tallinn, the first BODEGA field studies carried out in Athens, and the European Smarter Borders Forum on LinkedIn. Description: Workshop on Future Border Control - Toward Smart Human/Machine Task Allocation|15 European Border Management practitioners from national authorities and experts of 9 different Member States attended this event. Europol, The European Passenger Federation and the Eurosint Forum were represented. Description: This press release presented the BODEGA field studies carried out at Rome Fiumicino Airport on June 21st-22nd 2016. The two-day event was organised by Agenzia delle Dogane e dei Monopoli (ADM) and saw the participation of a delegation from the BODEGA consortium alongside representatives of Polizia di Frontiera. Description: This document constitutes the sixth of the six six-monthly reports that will be produced throughout the BODEGA project in order to summarise the dissemination activities carried out in the previous six months. The activities illustrated in the present report have been conducted during the period between M31 and M36 (December 2017 – May 2018). Description: This document constitutes the fifth of the six six-monthly reports that will be produced throughout the BODEGA project in order to summarise the dissemination activities carried out in the previous six months. The activities illustrated in the present report have been conducted during the period between M25 and M30 (June 2017 – November 2017). Description: This document constitutes the fourth of the six six-monthly reports that will be produced throughout the BODEGA project in order to summarise the dissemination activities carried out in the previous six months. The activities illustrated in the present report have been conducted during the period between M19 and M24 (December 2016 – May 2017). Description: This document constitutes the third of the six six-monthly reports that will be produced throughout the BODEGA project in order to summarise the dissemination activities carried out in the previous six months. The activities illustrated in the present report have been conducted during the period between M13 and M18 (June 2016 – November 2016). Description: This document constitutes the second of the six six-monthly reports that will be produced throughout the BODEGA project in order to summarise the dissemination activities carried out in the previous six months. The activities illustrated in the present report have been conducted during the period between M7 and M12 (December 2015 – May 2016). Description: This document constitutes the first of the six six-monthly reports that will be regularly produced throughout the BODEGA project in order to summarise the dissemination activities carried out in the previous six months. The video shows an example for video based risk analysis, developed by AIT and tested within the FP7 FastPass project. It shows the application of real-time algorithms used to detect lost or suspicious items in an controlled area (e.g. an eGate). The experiences made during the projects helped AIT to better understand the needs by border guards and travelers, culminating in human factor recommendations for video based systems within the BODEGA project. The video shows a first version of the handheld mobile border control device developed by AIT within the FP7 MobilePass project. The work done in this project proved as a good basis to develop new human factor recommendations for mobile border control within the BODEGA project. Furthermore, a new version of the device implementing some of these recommendations, with improved ergonomics (e.g. housing) and a more user friendly UI, has been developed. The video shows another scenario in which video based technologies can help the work of border guards and shows person tracking and person separation for detecting multiple persons within an controlled area (e.g. an eGate). The technology was developed by AIT and evaluated within the FP7 FastPass project. Again, the experience made within has been reflected in the human factor recommendations for video based systems within the BODEGA project. The video shows how video based technologies can help border authorities or (air) port operators to better manage longer queues, in order to allow for a smooth and hassle-free border crossing of travelers. The technology shown in the video has been previously developed and tested by AIT. The findings and experiences gained in this context were in turn incorporated into the recommendations of the BODEGA project. The Joint BODEGA-ABC4EU Showcase Event took place on May 2nd - 5th 2017 in Levi, Finland, hosted at the Levi Spa Hotel. The event provided an opportunity to expand the enduser community of the BODEGA and ABC4EU research projects while contributing to the dissemination, discussion and validation of their results. While the aim of BODEGA is to enhance efficiency, security and traveller experience of the border control process taking into account human factors and ethical aspects, ABC4EU1 (Automated Border Control Gates for Europe) aims to harmonise border control technology in accordance with Smart Borders legislation. The initiative was conceived in response to the European Commission’s call for greater cooperation between EC-funded research projects. A special focus was placed on discussing the preliminary results of the two projects in light of the EU’s changing legislation in the area of border control. The event saw the participation of 43 persons including members of EU and national law-enforcement agencies, representatives of Ministries of Internal Affairs of EUMember States, European universities, lobby groups and NGOs involved in activities related to security, technology and ethics. Chatham house rules were adopted throughout the event in order to stimulate open discussion. An Etherpad solution was also put in place allowing participants to ask questions in real-time and exchange views in an anonymous fashion. Workshop 7 consisted of a group discussion around a set of key questions put forward by the European Commission. On 29 June, the second BODEGA workshop gathers European border control experts to exchange on the challenges raised by the implementation of stronger and smarter borders. This workshop focussing on the consequences of the digitalisation of border control processes gathered eighteen border control professionals from different relevant Member States’ services – police, customs, border guard agencies – representing 12 European countries. The European agency FRONTEX was also in attendance. On 12 November, a one day end-users workshop was organised in Brussels in the context of BODEGA project (BOrdDErGuArd – Proactive Enhancement of Human Performance in Border Control). This was the first workshop from a series of six workshops scheduled during the project’s duration organised by CEIS (European Company for Intelligence Strategy). This workshop was a real success with the attendance of 30 people from all over Europe: Federal Police of Belgium, Border and Coast Guard Academy, Hellenic Police, Dutch Police, FRONTEX, customs and part of the BODEGA consortium members (VTT, UIC, CEA, Thales, CEIS, Hellenic Police and Border and Coast Guard Academy). This workshop was also the opportunity to present the end user’s perspective on Smart Borders. A scenario was then presented, allowing for interactions and reactions from various police end-users, and to have their feedback and suggestions. In the afternoon, the consortium members presented the organisational, human and technical factors that they had already indentified in the framework of BODEGA. This workshop allowed the consortium of BODEGA to adjust their understanding of the issue of BODEGA to the reality thanks to the suggestions, explanations and advice of the present police representatives and border guards. The workshop was really fruitful and interactive thanks to the implication of both the consortium of BODEGA and the end-users and will help UIC to coordinate the BODEGA field studies on all four transport modes (air, maritime, rail and road). Beyond this workshop and still in the framework of BODEGA, UIC wants to point out that Polish Railways (PKP PLK S.A.) has accepted UIC’s proposal that their company would provide the support/assistance for BODEGA Project Consortium in relation with the Polish Border Guards during the implementation of the project in the frame of their possibilities and competence, excluding any financial or in-kind commitment. They assume that making contact with the parties engaged in the project is the responsibility of the project officers. They suggested getting in touch with the security entities at the border point in advance. On 18 & 19 January 2017, CEIS organised a workshop entitled “Digital Transformation in Border Control – The Impact on Border Guards’ Work and Training” within Atos premises in Madrid. This event was held in the framework of the BODEGA project - www.bodega-project.eu. 18 European Border Management practitioners stemming from national authorities of 7 different Member States attended this event. Frontex - the European Border and Coast Guard Agency, the United States Department of Homeland Security and the World Customs Organisation were represented as well. On this occasion CEIS, VTT and UIC presented some of the results of the research conducted within the BODEGA project and representatives from Frontex, the United States Department of Homeland Security and the Royal Netherlands Maréchaussée presented their views on the impact of Digital Transformation within their respective organisations. Each presentation led to thorough exchanges with the audience and allowed the BODEGA team for gathering valuable inputs to inform the next steps of the research. Also, two technology demonstrations were organised during this event. On the first day Atos presented a mobile device compatible with the upcoming EU Stronger and Smarter Border legislation and on the second day Thales demonstrated a mobile device made for the enrollment of biometrics data. 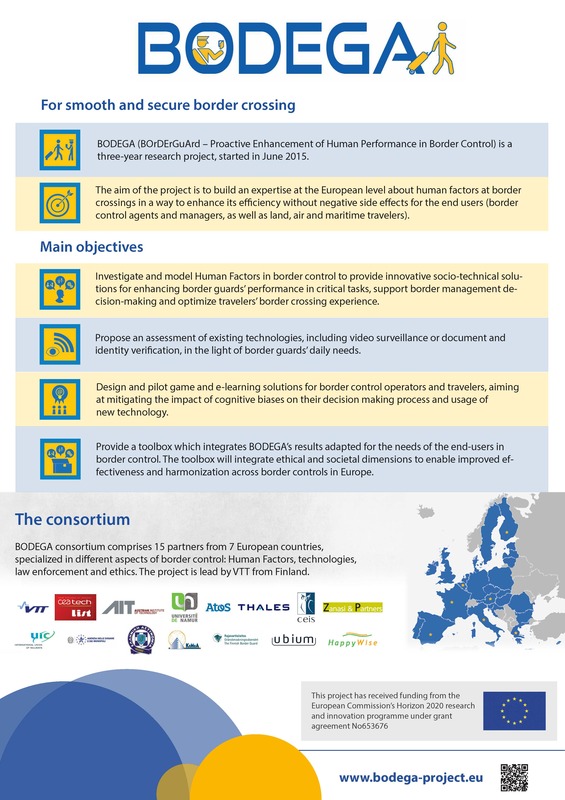 This event was organised by CEIS in the framework of the European H2020 Security project BODEGA - “BorDErGuArd – Proactive Enhancement of Human Performance in Border Control”. The objective of BODEGA is to assess the impact of the current European legislative procedure and technological developments on the work of border control practitioners. The outcomes of the project aim at taking into account human factor aspects in relation to border control and thus improving the efficiency of the process without creating negative side effects for border control agents and managers, and for travellers. The objective of the European Smarter Borders Forum is to foster exchanges of ideas among border management professionals, academics and the industry in the context of the discussions on the Smart Borders package at the EU level. The forum will become a platform for knowledge exchange and discussions on topics pertaining to smart borders, border management decision-making processes and optimisation of travellers’ performance. It also intends to facilitate relations among European border management professionals by allowing them to share best practices as well as relevant pieces of news such as events, studies and press articles. Border Guards, Border Guards’ Managers, Customs, Police, Travellers’ Representatives and other stakeholders impacted by the implementation of the Smart Borders. Description: ABC4EU stands for Automated Border Control Gates for Europe. It is an EU wide project and involves a Consortium of 14 partners from 7 different countries, with a budget of 16,8 Million Euros, 70% EU funding. The aim is to make border control more flexible by enhancing the workflow and harmonizing the functionalities of Automated Border Control (ABC) gates, which are only one example of automation. Description: FastPass is an integrated project funded by the European Commission under its Seventh Framework Programme (FP7). The project is designed to establish and demonstrate a harmonized, modular approach for Automated Border Control (ABC) gates. Border control is a key factor for guaranteeing mobility and security within the European Union; it has to comply with very different - when not opposite- kind of demands: privacy-compliant, quick, accessible and easy to use border crossing process for the travellers; secure, precise, highly reliable system able to detect several kind of threats by border crossing (piggybacking, counter-spoofing...) for the border guards. FastPass should provide an answer to these expectations and therefore develop an innovative solution centered on the end-users requirements, fully respecting the Data Protection concerns and innovating beyond state-of-the-art technologies for more efficiency. The final system will be then tested at the three type of borders: air (Vienna Airport, Austria), land (Moravita’s border crossing point, Romania) and sea (Greece) to assess its transferability to the market. FastPass will produce a harmonised border crossing solution, a modular system for land, air and sea borders, a highly reliable and privacy compliant architecture, and an improved, innovative user interface. Description: MobilePass is a FP7 research project, which started in 2014. Over 2 years, the MobilePass Consortium focused its efforts on developing a technologically advanced mobile equipment for the land border crossing points. This new device enables border control authorities to check European, visa-holding and frequent third country travellers in a comfortable, fast and secure way. The mobile solution incorporates new technologies needed in mobile scenarios and embeds them in the actual border crossing workflow to speed up control procedures. • Offer the research, specifications and experience from the prototypes to European border and law-enforcement agencies, to European technology suppliers, having first established the legal and social propriety of such initiatives. Description: iBorderCtrl is an innovative project that aims to enable faster and thorough border control for third country nationals crossing the land borders of EU Member States (MS), with technologies that adopt the future development of the Schengen Border Management. iBorderCtrl includes software and hardware technologies ranging from portable readers and scanners, various emerging and novel subsystems for automatic controls, highly reliable wireless networking for mobile controls, and secure backend storage and processing. One of the main goals of the project is to design and implement a comprehensive system that adopts mobility concepts and consists of a two-stage-procedure, designed to reduce cost and time spent per traveller at the border crossing station. iBorderCtrl also focuses on the land border crossing points: road, walkway, train stations. It addresses the better facilitation of thorough checking required for third country nationals that intend to cross EU borders. • prepare for the further development of this concept beyond this project by linking to other known risk-based border management projects (in- and outside EU, within EU research frameworks and on national levels), and describe how their results contribute to a single cohesive risk-based border management concept. 15 December 2017 BODEGA eGates field studies conducted at border-crossing points in Belgium, Finland and Greece in 2017 The BODEGA team had the opportunity to conduct field studies at border-crossing points with e-Gates in Finland, Belgium and Greece. During these field studies, around 58 interviews with border guards, including managers and trainers, were performed, together with observations with regards to the behaviour of border guards as well as travellers. WP1 focuses on the day-to-day management tasks of the BODEGA project, ensuring that it stays on track, and that all planned deliverables are met. Work Package 2 creates an analytical overview of existing approaches to the consideration of human factors in border control. Particular attention will be paid to the integration of ethical and societal issues in order to clarify a clear mapping of possible areas for innovation and unclear problems. WP3 will produce an understanding of the human factors and motivational issues of border guard’s work and border control tasks. The physical, organisational and technical environment will be taken into account. This understanding will be mainly achieved thorough field studies in which border guard work is observed and studied by interviewing different stakeholders including border guards, decision makers and passengers. The field studies will be carried out at several air, sea and land borders. In WP4, the data from WP3 will be organized within task models to deliver a comprehensive picture of the human factors at border crossing. Work package 4 will also process the data gathered in WP3 for an in-depth inquiry of skills and effective abilities of border controllers implied during border control. The study will focus on cognitive processes implied during document verification, identity verification and more particularly to perception strategies and attention (for example face recognition), situation awareness and decision making. WP4 will provide first requirements for smarter borders regarding human factors. Provide first requirements for smarter borders regarding human factors. Based on WP2, WP3 and WP4 findings, WP5 will concentrate on the border control task allocation between human and machine. It will propose innovative interaction between humans and technologies. The study will focus on traditional duties like document verification, identity verification and risk assessment on the travellers. WP5 will produce recommendations based on studies and/or mock-ups to simplify the border guard’s operational mission. These recommendations will be integrated into the PROPER toolbox. In relation with WP7 this output will be used to evaluate how the different concepts are working. WP7 will gather end users’, border management decision-makers, border guards and travellers’ representatives, inputs and assess the results of the project iteratively. The work package will start with identifying the various stakeholders on EU border control and security from policy makers to industry to researchers in previous border control projects, to create a network for facilitating the exchange of best practices and for co-developing the Toolbox. Then Work package 7 will integrate the validated results as a toolbox and create a network of stakeholders and facilitate the exchange of best practices between end-users, researchers and the academic and scientific community. Build up a comprehensive stakeholder map and a network for the gathering end users’ - border management decision-makers, border guards and travellers’ representatives - inputs and assessing the results of the project relying on an iterative feedback process in different phases of the project. Create a network of stakeholders and facilitating the exchange of best practices between end-users, researchers and the academic and scientific community and related projects conducted in the framework of FP7 and, if applicable, H2020. This will be done in workshops but also through private internet workspace accomplished in WP8. Ensure and show in measurable terms that the results developed in earlier work packages will of high quality for end users and with regards to innovativeness and applicability in border control. This aim will be achieved by designing a common methodology and criteria for measuring the success of the results and arranging validation and evaluation actions through a number of end user workshops and iterative co-design activities. Collect the validated results in a toolbox - PROPER Toolbox – to promote taking the results into use for the benefit of border control and the work of border guards. The Toolbox will be carefully validated as well with different users and stakeholders. WP8 manages the dissemination of the knowledge generated and the results achieved during the whole project duration. 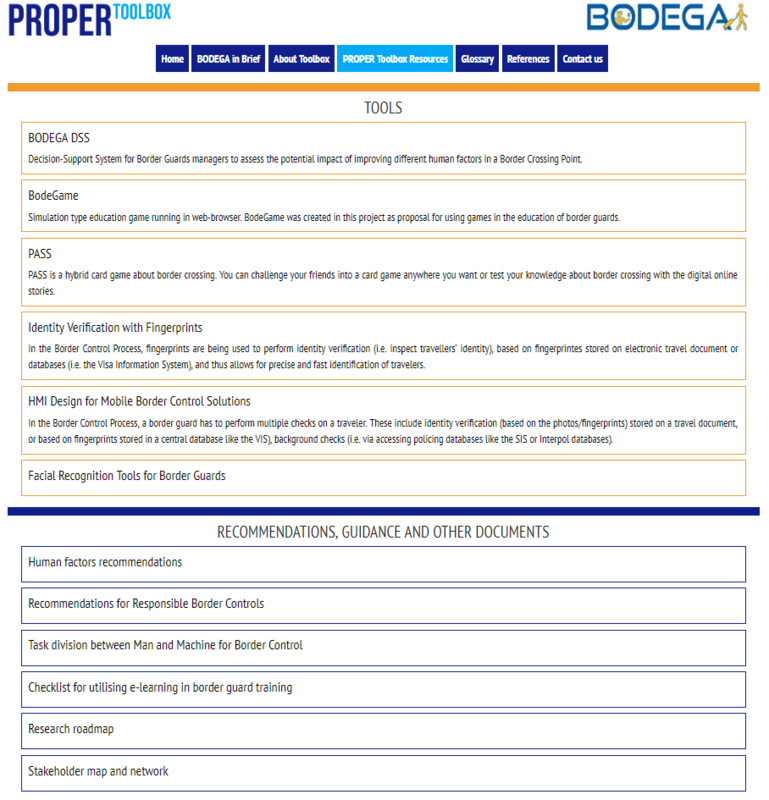 The work carried out in WP8 is intended to generate awareness of the BODEGA project across any interested stakeholder, including border control authorities, law enforcement agencies, experts in privacy and ethical issues, psychologists, artificial intelligence practitioners, manufacturers of border control technologies (both hardware and software), teaching and training institutions, governmental and enterprise decision-makers. 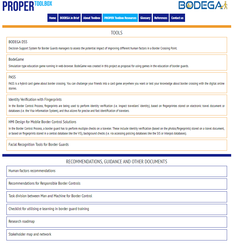 The use of the BODEGA project’ website implies full acceptance of the following terms and conditions. All trademarks and logos displayed on the website www.bodega-project.eu are the property of the International Union of Railways (UIC) and protected by the intellectual property laws applied in France. They may not be used or copied in any way without prior and express permission from the International Union of Railways (UIC), which reserves the right to prosecute any act infringing its intellectual property rights. The BODEGA project provides links to third-party and external websites, for which it disclaims any responsibility. The insertion of these links does not in any way imply the approval of or an existing partnership with any of these sites. In no event shall the BODEGA project be held liable for the referencing of these sites on its website. The insertion, on external sites, of hyper links to the BODEGA project’ website is subject to prior and express permission from the BODEGA project. It is the responsibility of all Internet users consulting the BODEGA project’ website to avoid infecting the site with viruses of any description. The BODEGA project assumes no liability for any direct or indirect damages arising from access to or use of the site www.bodega-project.eu or the information contained on it. Personal information obtained via the discussion forum on the BODEGA project’ website may not be used for purposes other than to contribute to the proposed discussion topics. Users have the right to access, change, correct or remove any of their personal information (as provided for by Article 34 of the French Data Protection Law of 6 January 1978). Users may ask for their comments on the discussion forum to be removed at any time by sending a message to webmaster@nextstation2015.com or by writing to UIC – Legal Department, 16 rue Jean Rey, 75015 Paris. The BODEGA project’ website has been created and edited in compliance with the laws applied in France. In accessing this website, Internet users resident outside France shall ensure that they are in compliance with the locally-applicable legislation relating to the use and content of this website. The BODEGA project assumes no liability whatsoever for any direct or indirect damages arising from the use, access or inability to access the BODEGA project’ website. Neither shall the BODEGA project be held liable for the risks related to the completeness, accuracy, suitability or topicality of the information. The site www.bodega-project.eu is hosted on the UIC’ server hardware. from eNews Nr 453 BODEGA – First rail field studies began in Brussels on 8 April!